Nicotine withdrawal increases threat-induced anxiety but not fear: Neuroadaptation in human addiction. Neuroscientists have definitively shown that stressful events cause relapse to drug use in rodent models of addiction (e.g., ‘stress-induced reinstatement’). This research suggests that brain stress circuits involving noradrenergic and corticotropin-releasing factor neurotransmitter systems become overly reactive (‘sensitized’) after chronic drug use and this leads to elevated anxiety and drug-seeking behaviors. Our laboratory has initiated a program of research that examines the stress response of drug-deprived humans to confirm that these changes in the stress system (‘stress neuroadaptations’) observed in animal models generalize to humans. 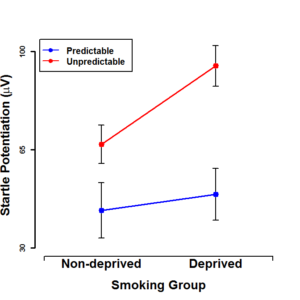 We tested the hypothesis that nicotine deprivation would lead to increased response to stressors in humans only under certain conditions – when stressors are unpredictable but not predictable. This thesis follows from basic affective science that indicates that unpredictable stressors selectively activitate the stress circuits believed to display these neuroadaptations. In this study heavy daily smokers were asked to either continue their normal smoking pattern or stop smoking for 24 hours before the experiment. Participants then were exposed to stressor (electric shock on finger tips) that was either unpredictable or predictable while we measured their startle eye blink response. You can think of the startle response similar to how much you would jump when someone yells “boo”; you might startle more when you’re anxious or afraid (imagine watching a scary movie) than when you’re calm and relaxed. In this study, nicotine deprivation increased the startle response during unpredictable shocks (see rising red line in the figure), but did not alter the startle response during predictable shocks (see flatter blue line in figure). This study helps to ‘translate’ parallel lines of research from rodents to humans that shows elevated stress responses during early withdrawal from nicotine. These results provide evidence that the startle response during unpredictable stressors may be an objective marker of changes in biological stress systems among smokers in nicotine withdrawal. Our research team has recently extended this program of research and found similar effects among both regular heavy marijuana and alcohol users. Our next steps aim to incorporate these stress reactivity tasks into clinical trials to examine how medications for addiction treatment can reduce the hyperactive stress response and thus help people quit smoking.